Since July 10, I have been experiencing an identity crisis of sorts. You see, I changed my name when we got married. I didn’t want to drop my middle name, and I didn’t want to lose my maiden name, so I just decided to add Farley on—having four names is a little muffy-buffy for me, I’m sure it’s pretentious, but hey, this is what I went with. Now that it’s nearly November, the kids at school are more used to calling me Mrs. Farley, and I’m (strangely) more used to answering to my new name–the change has been quicker than I thought. Some still call me Miss Frazer, since that’s how they met me, but it’s becoming odd to the ear to hear my old name—even though I had that name for so many years. Yesterday afternoon, the hubs went out for a bit and I decided to be utterly domestic and sweet and bake the boy something good. While I was covered in flour (from the yumminess on which you are about to feast your eyes), there came a knock on my door. I answered it, and standing in front of me was a door-knocker for a local candidate (November IS coming, you know). Technicially, it’s Mrs. Farley’s house now… I think to myself. And thus our campaigner walks away. And I can get back to feeding Farley! So, as I am growing more familiar with recent changes in nomenclature, I recognize I am still good ole Miss Frazer somewhere on the inside. Kind of like the following recipe: you can call it what you like, but it’s all the same. Some of the potential names included: Inside-Out Apple Pie, Apple Swirls, Deconstructed Apple Pie. 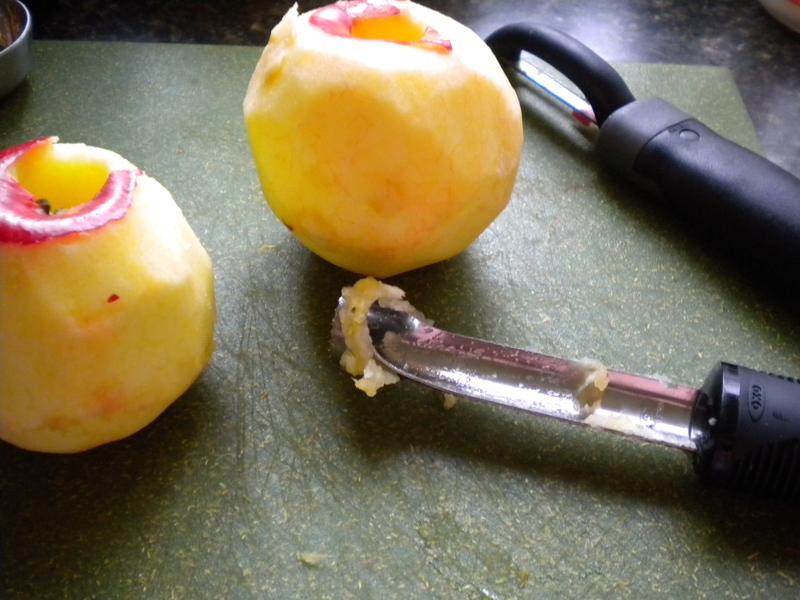 1–Peel, core, and chop up about 2 cooking apples (I used Rome) and set aside–enough to make about 2 cups. 2–Preheat your oven to 350 degrees. 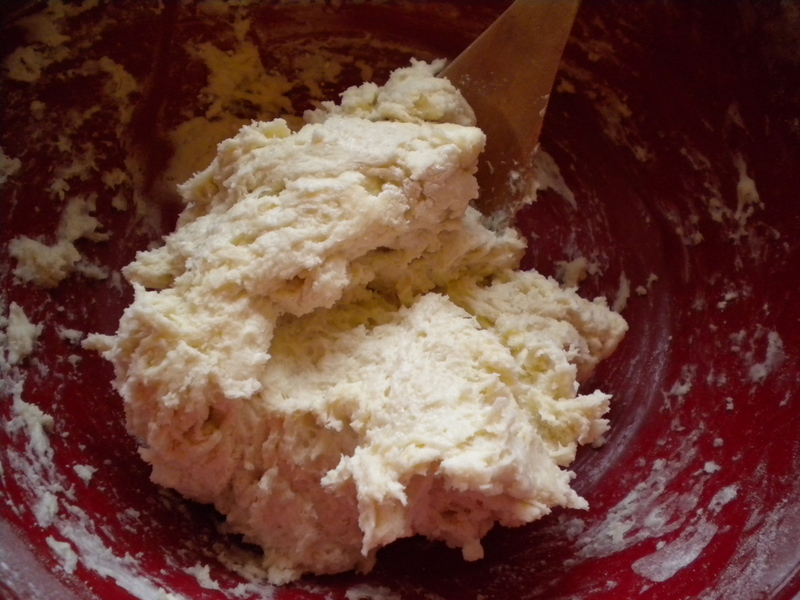 3–In a decent-sized bowl, combine 1 1/2 cups flour, 1 tsp. baking powder, and 1 tsp. salt. 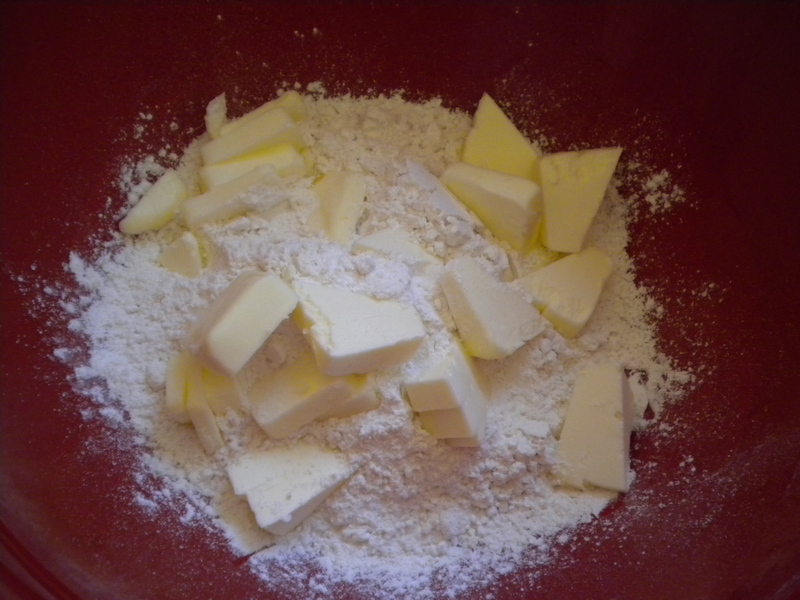 4–Add in 1 stick of butter, cold–cut it in till it gets to look like fine crumbs. Had I a pastry cutter, I would totally use it….but I used the fork method instead. check this baby out, miss paula deen! 5–When your flour mixture is lookin super crumby, add in 1/3 cup milk at room temperature. Stir in and mix until it just comes off the sides of the bowl–may require some effort, but I believe you can do it! 6–Take your dough and place it on a floured surface, knead it about 5 times, and roll out to a 9 x 11 rectangle. 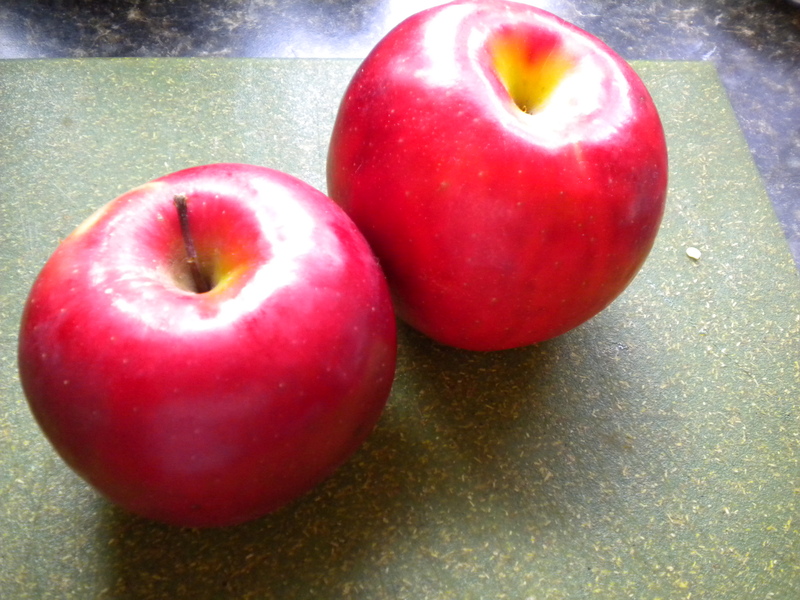 7–Add your apples into the mix and sprinkle with 1 1/2 tsp. cinnamon!!! 8–Roll up the pastry jelly-roll style, and cut into slices 1 1/4 inch thick. Place in a round cake pan (that you have pre-Pammed or greased, of course). 9–In a small bowl, mix up 1 cuppa water and 1 cuppa sugar to make a sugary syrupy sensation and pour on top of your apple slices. 10–Bake for 45 minutes and sprinkle 1 tsp. sugar over the top of your dumplins for 15 minutes more. Don’t resist the urge to eat them immediately, but do give it a second to cool off, you know, so you don’t burn your tongue and all. Farley loved’em. …so delicious, and easier than pie. Literally. Thanks Lauren! Glad you are following along; I will try to place captions with my photos more often for ya. Ohhh, that looks so good and easy! I’m all for simple! I just bought a bunch of granny smith apples, I’ll have to try it! 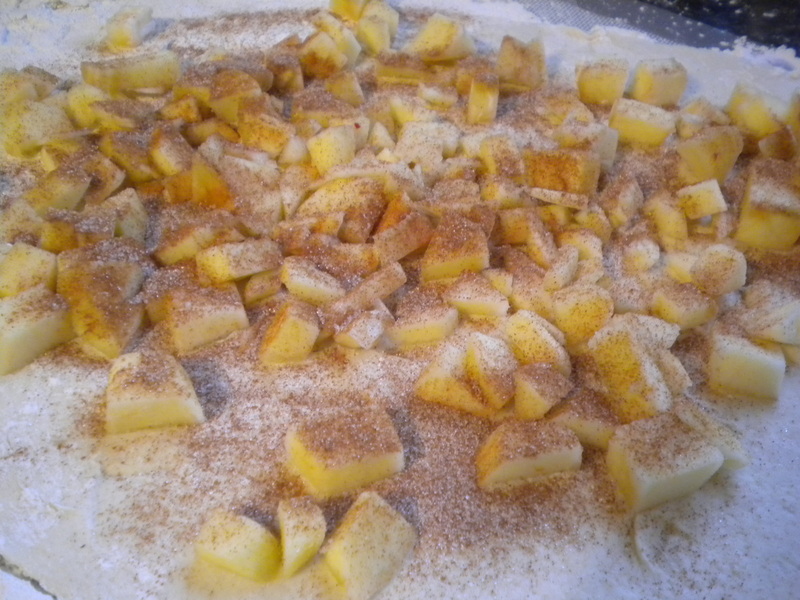 I like tanginess to my apples, but hopefully that’ll translate well into a dessert! I have a last name crisis too – My social security card has my new name, but my driver’s license has my old name! My fear of the DMV has prevented me thus far from making the necessary changes . . . But figuring out what to put down on stuff is VERY confusing! Hey Allison! 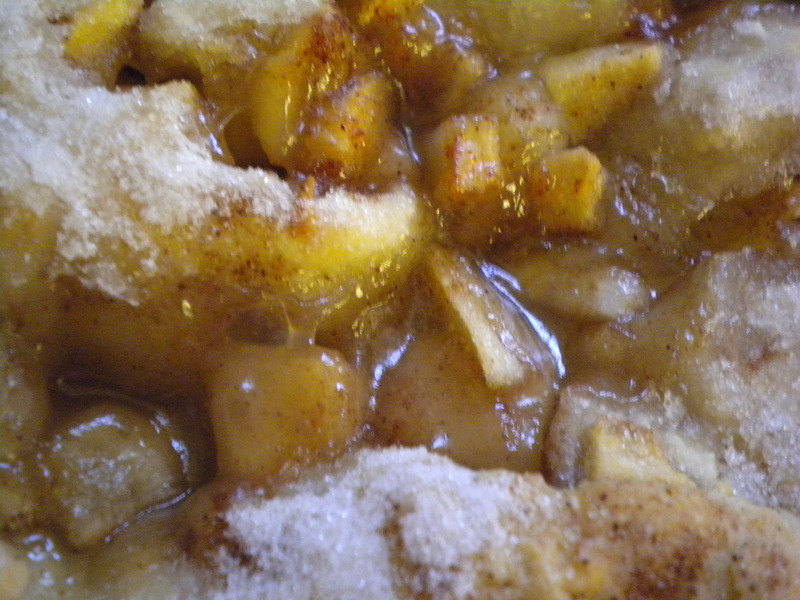 I think your granny smiths will work well; my hubs believes they are the universal baking apple–I just had plenty left from the apple festival we went to recently and figured I’d bake’em up. Don’t’ be afraid of the DMV! Actually, have you gone to your DMV website to see if there are any papers you can print off beforehand so you spend as little time as possible? 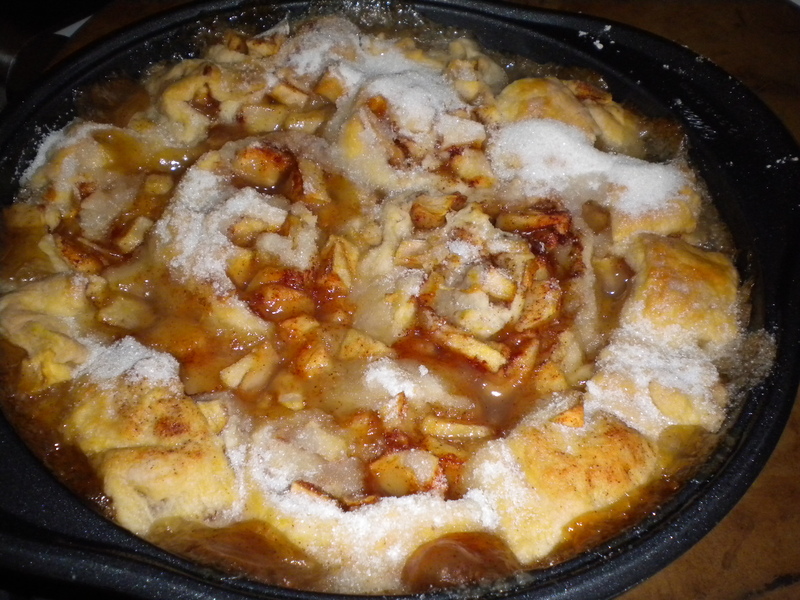 Made this last night with granny smiths(cause that’s what i had) mmmmmmm…so good! A small scoop of ice cream also adds to the deliciousness! This looks totally amazing i can’t wait to try making it! Hey Julio my darling! Let me know how it goes for you! Looks so good! It’s in the oven now and smells amazing!